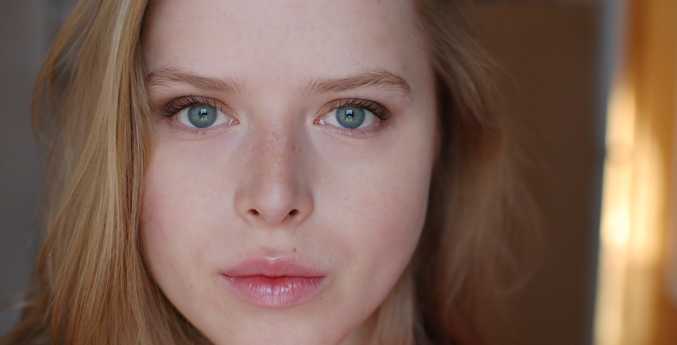 What better way to inaugurate my new blog than to introduce my most recent make-up splurge? 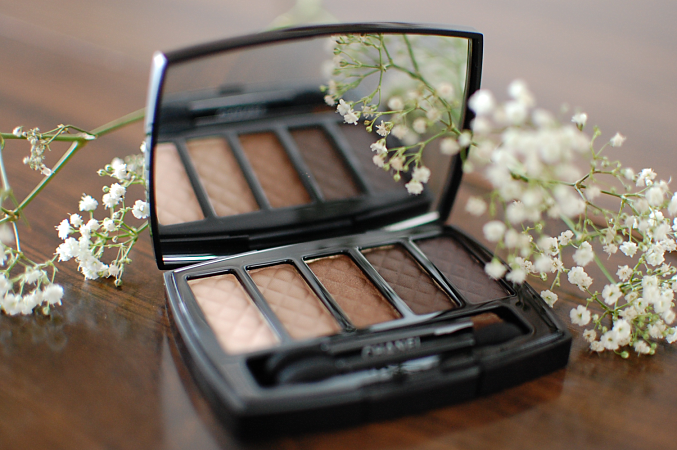 It is none other than the lovely limited edition Charming palette, the highlight (in my opinion) of their Holiday 2013 collection: Nuit Infinie. Yes, it is another one of those "natural eye" palettes, a gradation of "safe" shades of beige and brown and grey. However, since I am far from being the most diligent eyeshadow wearer there is, this kind of color selection never fails to sway me. 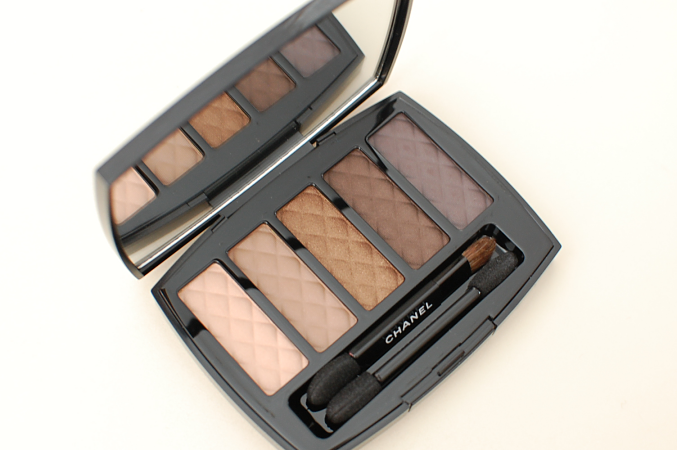 I have never owned Chanel eyeshadows before, but the gorgeous colours and luxurious feel of this palette managed to break my resolve. Of course, the presentation is flawless. 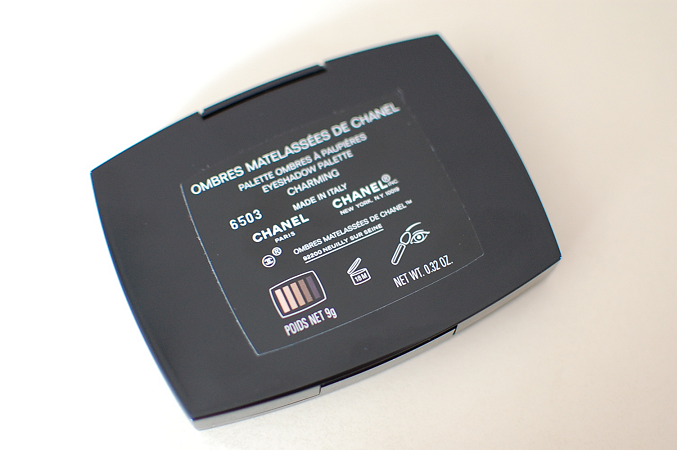 I always thought that Chanel packaging was the most beautiful of all, greatly surpassing that of Dior make-up, for instance. A classic black case, their iconic logo, a nicely-sized mirror: practical and elegant at once. These shadows are particularly nice to look at: embossed as they are with a familiar quilted pattern, they bring to mind, among others, the brand's famous bags. As for the price, it is excessively high. From what I saw while browsing other reviews, it is sold for $80 in the United States. Here in Canada (precisely, at The Bay), it was slightly lower: C$75, which as we speak amounts to around US$71. An unexpected price difference, considering that it usually goes the opposite way for us Canadians, who have to pay more for most products (if you know why this palette is cheaper in Canada, then please let me know!). To be honest, I would not have bought it at either price – but I had a C$30 reduction saved up on my HBC Point Card, and decided to use it to bring down the price to C$45. Still expensive, I grant you; but much more tolerable. The contents of the palette are as follows: 9g of shadows, and two double-ended applicators, which I don't predict I will use unless I won't have my brushes at hand. You can get a closer look at the pretty shades in the picture above; sadly, I'm completely incapable of swatching things, so you can click over to The Beauty Look Book or Temptalia for an accurate look at how each shade looks on the skin. Except for the golden color in the middle, which has a fair amount of festive shimmer (but looks gorgeous, and not overpowering, on the eyes), the shadows only have a hint of it, subtle and wearable. Make-up worn in these pictures: Chanel Charming palette, MAC eyebrow pencil (Fling), Maybelline Volum' Express mascara (Black/Brown), Maybelline Dream Lumi Touch concealer (Ivory) and Nivea Lip Butter (Vanilla & Macadamia). I personally really like this first attempt at a look, and I can say I truly love this palette. The shadows are smooth and easily blendable, and I find that the color selection suits my eye and skin color very well (although it also looks stunning on darker-skinned and chestnut-eyed girls, as demonstrated by Radhika from The Weekend Ramblings). You can work with the colors as you please, leaving the eyes very natural or, on the contrary, creating a full-on smoky eye. Now, is it worth the price? As I said previously, I would not have purchased it for $75 or $80, even if it is the ideal palette for me. It is simply too much, especially if, like me, you own similar colors in other neutral palettes. However, I'm really glad I got to use my discount on this, because it is a beauty and I can already see it becoming a staple of mine. So, if the price doesn't bother you, or if you don't have something similar in your make-up drawer, then by all means, go for it! But do it fast, because they're selling out: when I purchased mine last Tuesday, my counter had only 4 of them left. Sont tellement beaux les packagings chanel! I wonder why the price was cheaper in Canada compared with the US. That's a good thing I suppose! Good to hear you got a discount on it as well :) It is very expensive otherwise. 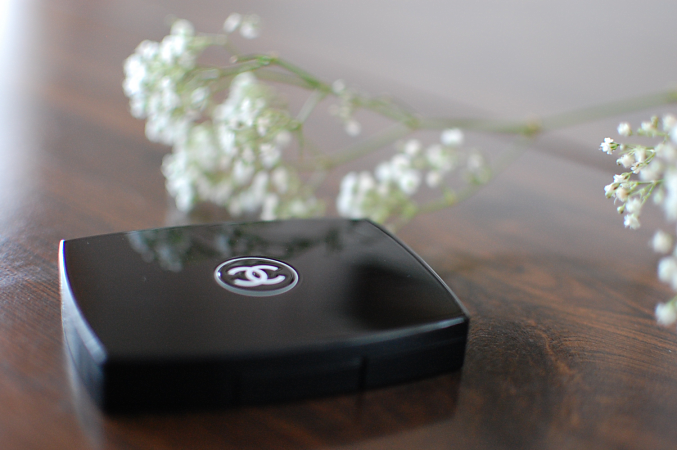 I agree Chanel packaging is gorgeous but the price is normally way out of my price range. Yes, I still don't understand, but I'm not complaining! And I completely agree about the price, I don't buy from Chanel unless I really want to treat myself or if the product seems amazing and unique (like the Graphite nail polish). So I'm really glad I got that discount! Of course :) And I do too! I've been eyeing the Bobbi Brown Rich Chocolate palette (I think that's what it's called) but this neutral palette buying spree has to stop :)! Haha. It is beautiful, yes :)! 22. Born in Ukraine, raised in Montreal, Canada. Interested in beauty, books, lifestyle and good food.